1. Who are you, why are you qualified to speak out on Fantino’s Caledonia record, and are you really Conservative Party supporters? The leaders of this campaign are Gary McHale and Mark Vandermaas, two of the key activists involved in exposing and opposing racial policing in Caledonia that has victimized both native and non-natives for the past four years. We have 3.5 years experience of being targeted by Fantino and dealing with him and his lawyers through the courts, the Human Rights Tribunal of Ontario, the Ontario Police Services Act complaint process and the media. We provided extensive evidence and background information to aid Globe & Mail reporter Christie Blatchford’s research for her upcoming book, HELPLESS: Caledonia’s Nightmare of Fear and Anarchy, And How the Law Failed Us All, due on bookshelves Oct 26th. 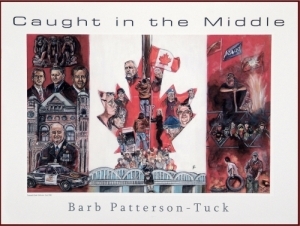 Gary (and wife, Christine) is acknowledged in the book for his contributions, and both the book and the photo montage in the promo video below include an iconic image of him being led away bleeding after he was viciously attacked by Six Nations smokeshack supporters Dec 01/07. While still in the hospital Fantino issued a press release blaming him and his supporters for the violence – before the investigation had begun – and ordered his officers to target McHale for a charge. Helpless tells how he fought back and won – without a lawyer. In the 2008 federal election 1,821 Caledonia voters chose Gary McHale as an independent candidate over Conservative cabinet minister Diane Finley and high-profile Liberal candidate Dr. Eric Hoskins (now Dalton McGuinty’s Minister of Citizenship and Immigration). Gary received 10% of the total vote in the riding, which included 39% of ballots cast in Caledonia. Although we are not currently ‘card-carrying’ Conservative Party members, we are lifelong supporters. Mark was once a member of the original Reform Party when it was led by Preston Manning. 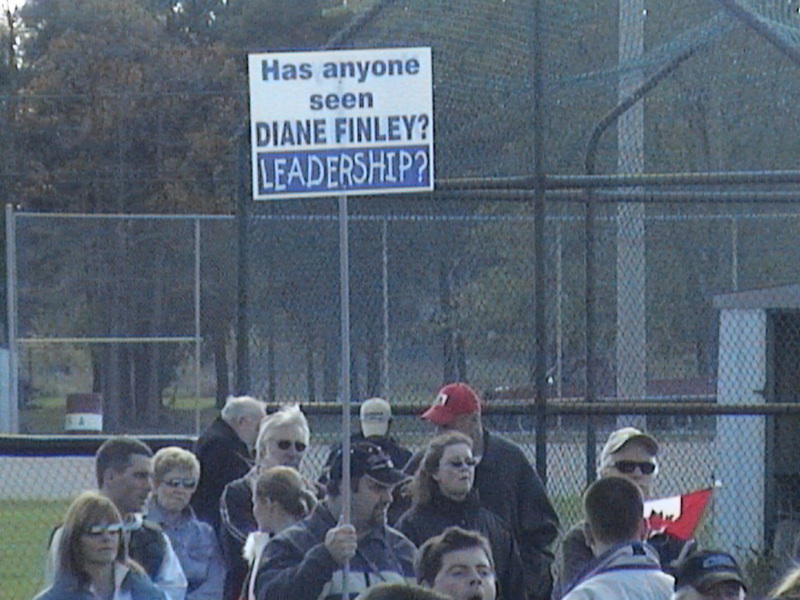 Some of our strongest allies in Caledonia have actively campaigned for Diane Finley and donated money to the party. 2. Why is it so important that Julian Fantino not be elected as a Member of Parliament for the Conservative Party of Canada? Julian Fantino is a symbol of the Race-Based Policing practices in Caledonia that saw innocent property owners victimized with illegal occupations while OPP officers stood guard for those committing the crimes. His candidacy for the Conservative Party would symbolize that the party has fully embraced racialized policing and the dangerous ideology that innocent victims should be controlled, silenced and targeted for arrest as an alternative to enforcing the law against extremist groups. Julian Fantino has shown scarcely believable bias in favour of native criminals all the while using the full weight of his office to try to intimidate peaceful, law-abiding non-natives into compliance. 1. Under Fantino’s watch four non-native Canadians were arrested for ‘crime’ of holding a Canadian flag or trying to raise one on public property across from the occupation site. OPP officers repeatedly lined up to prevent non-natives from walking down the road with flags. 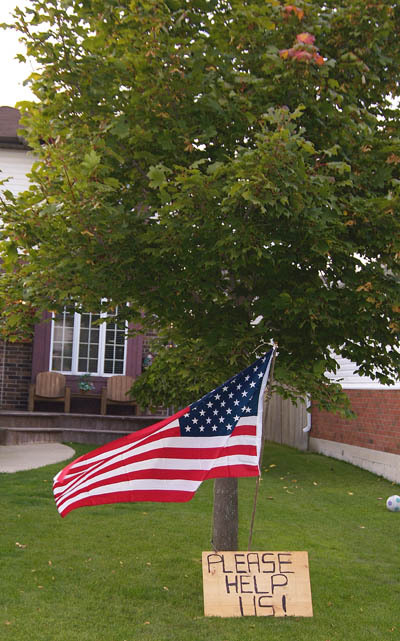 In the case of Mark Vandermaas, Fantino’s lawyer told the Ontario Human Rights Commission he was prevented from putting up a flag to protect him from an “extreme element” who might want to harm him. This policy of arresting victims instead of protecting their rights continued until July 2009 when non-natives were finally permitted to put a flag on the spot where a resident was first arrested for the same ‘offence’ in 2006. 2. Threatened Haldimand Council in order to intimidate them into not showing support for non-native activists via an email which eventually resulted in a Superior Court judge issuing process for a criminal charge of Influencing Municipal Official against him. 3. Intimidated Haldimand’s Mayor Trainer a second time via email after she spoke out publicly against OPP policies on behalf of residents. 4. Two of Fantino’s most senior officers were ordered by a court to face charges for Obstructing Justice after they followed his orders – at the outset of an investigation – to get Gary McHale charged with something so they could obtain bail restrictions to keep him out of Caledonia. Fantino told them not to “get bogged down with legal nuances” while doing it. Fantino’s order resulted in a charge which was eventually dropped after the Obstructing Justice charges were certified. Disclosure revealed that Fantino was communicating with the Deputy Minister of Community Safety & Correctional Services about the charge. 5. Set in motion, when he was first appointed, a plan to arrest Gary McHale that eventually involved numerous officers and government lawyers even though he had committed no crime. The plan resulted in McHale being held overnight without a charge until a judge ordered his release. Fortunately, a Crown Attorney refused to go along with an OPP request that he lay a false Mischief charge so the police could get bail restrictions to keep him out of Caledonia. 6. Filed a police conduct complaint with the Hamilton Police Service after a Caledonia resident who happens to be a Hamilton police officer criticized the OPP and the Premier. The complaint was initiated when the Ontario government’s senior negotiator contacted the OPP. It was eventually dismissed. 7. Defamed non-native activists in the media with false accusations of being violent racists who want a Pakistani-style dictatorship. 8. Falsely accused non-native activists of being responsible for injuring his officers when he knew they were injured by native protesters. 9. After peaceful non-natives (and police) were sent to hospital after being assaulted at an illegal smokeshack by Six Nations people Fantino issued a press release falsely blaming the victims for the violence, and ordered his officers to target Gary McHale for charges – before the investigation had even begun. Fantino asked his officers in an email if there was any way to hurry up with a charge against McHale. 10. Wrote a letter of reference to the Court for the native man who led the violence against Gary McHale in which he blamed the violence on McHale – the victim. 11. A charge of Assault Police vs. the same native man who attacked Gary McHale disappeared within one hour of Fantino being notified. Fantino sends out email confirming the new list of charges. 12. Testified that he repeatedly meets with native protesters, but does not meet with non-natives. 13. Was photographed sharing a joke with one of the leaders of illegal occupations in Haldimand and the man who led the swarming attack that put Gary McHale in the hospital, but he refused Mayor Trainer’s request that he meet with non-native residents most traumatized by the lawlessness in Caledonia. 15: Refused Mayor Trainer’s request to meet with most aggrieved victims in Caledonia. 15. EXPOSED: How the McGuinty gov’t refused to investigate criminal allegations against Fantino (contains links to 71 page complaint to Minister re alleged Fantino criminal conduct & related docs showing repeated refusal to investigate, let alone ask for evidence. Separate courts would later order Fantino and two of his officers to face criminal charges that include Influencing Municipal Official and Obstructing Justice related to events cited in this doc. All charges dropped before trial by Attorney General of Ontario. 2. Why campaign or vote against the Conservative party – how does that help the party? 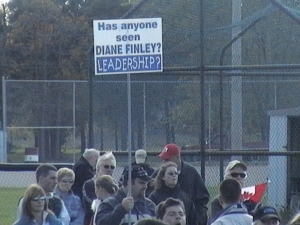 The Harper government and Diane Finley have been virtually silent for four years while innocent people were being traumatized by OPP/Liberal racial policing and native extremism. We are under no illusion that the Liberals or NDP will do ‘the right thing’ either, but the only way to force the Conservative Party to become conservative is to deny it the thing they value most: power. We need to teach the party that it will pay a serious price for ignoring its principles. Canada doesn’t need another Liberal Party, it needs a strong Conservative Party that stands for true equality and justice irregardless of race or grievance. If denying them power today contributes to that goal, then the short term pain is worth the price. 3. Are you actually going to vote Liberal or NDP and campaign for them? Yes – as much as the thought offends us, if Fantino is nominated we will actively work to defeat both him in Vaughan and Diane Finley in Haldimand Norfolk by campaigning and voting for the strongest runner-up who has the best chance of defeating them, be it NDP or Liberal. 4. What could you possibly do that would make a difference in the election – what’s your strategy? If we can convince the 5,000 voters in Haldimand who cast a ballot for Gary last time to switch their votes to the Liberals it would count as a 2 for 1 loss for Diane Finley. In other words, not only would the Conservatives go down 5,000 votes, the Liberals would also go up 5,000 votes for a total loss to Finley of 10,000 votes. In a riding where there was already so much anger towards the Conservatives long before Fantino was nominated and long before McHale had the credibility he has today 10,000 votes would very likely mean defeat for Finley. 5. Why not work behind the scenes and try to talk to the party? We have been trying to work behind the scenes, but cannot reveal the full extent of our efforts to make them aware of our concerns. You can assume from the creation of this site that we have no confirmation they are taking our concerns seriously. 6. What do you want? We want the Conservative Party of Canada to immediately put any movement to nominate Julian Fantino on hold until the party has fully reviewed the evidence of his conduct in Caledonia and fully understands the consequences of his nomination for the party. 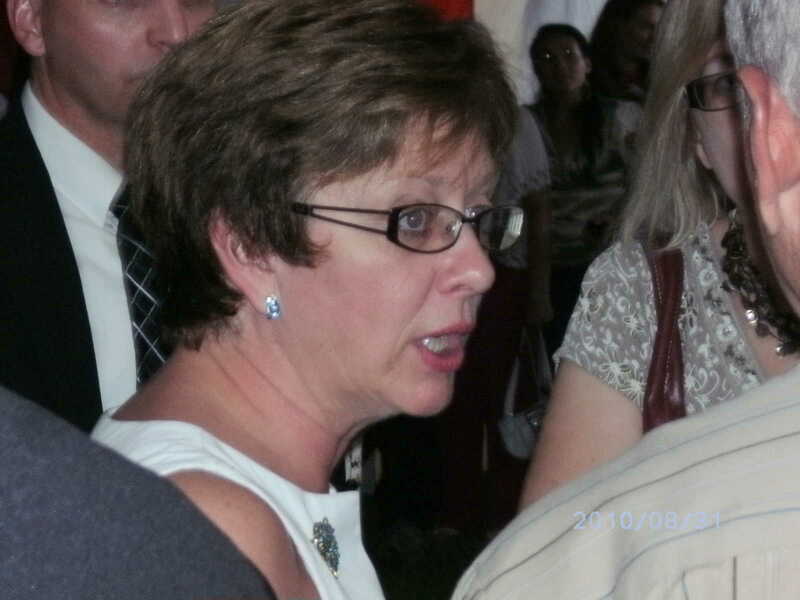 We are prepared to assist the party in every way possible as we did Christie Blatchford. 7. What can I do to help? – Protest with us every Saturday and Sunday at 1pm at Fantino’s campaign HQ until the election. We have 60,000 professionally-printed 2-page 8.5×11″ brochures to get our message out, so after a half hour protest we will be distributing our brochures in the riding. Details here. – Write a letter to the editor. – Call the Conservative Party and tell them you no longer support the party because of Fantino’s candidacy. If you are a donor, tell them you are stopping donations so long as Fantino and Finley are elected members. Behind the barricade remains, a Native patrol drives by in a red pickup in front of the press-board ramshackle “Embassy.” Outside DCE, a sign invites tourists. The Douglas Creek Estates were to be a bedroom community for Toronto and Hamilton. Small economic off shoots to strengthen the community were planned such as Chris Syries’ plans to open up a music school for 400 students. A class action suit is still under way representing the few businesses which have remained and are still fighting for justice. Conservative MP Julian Fantino hopes for re-election in Vaughan on Monday. He won the previously Liberal held seat by less than on thousand votes. However, the legacy he inherited and left behind in Haldimand Track, the events of Native occupation in Caledonia have come back to haunt him. Conservatives Against Fantino peppered his constituency during his by-election, and their information campaign may very well have contributed to his marginal win, although the 2008 election had Liberal Maurizio Bevilacqua win by over eight thousand votes. This movement has morphed into Conservatives Against Racism, now also targeting the Conservative Party elite who supported getting Fantino elected into Vaughan. In Haldimand-Norfolk, Liberal Bob Speller running against incumbent CPC Diane Finley, has been the first federal candidate to offer a Caledonia policy statement. Of note to Caledonia residents has been Finley’s conspicuous absence from their township and her silence regarding issues related to the Native occupation during this campaign. Recently, some of the main stream media played up a few resignations form the Julian Fantino Conservative MP re-election camp. 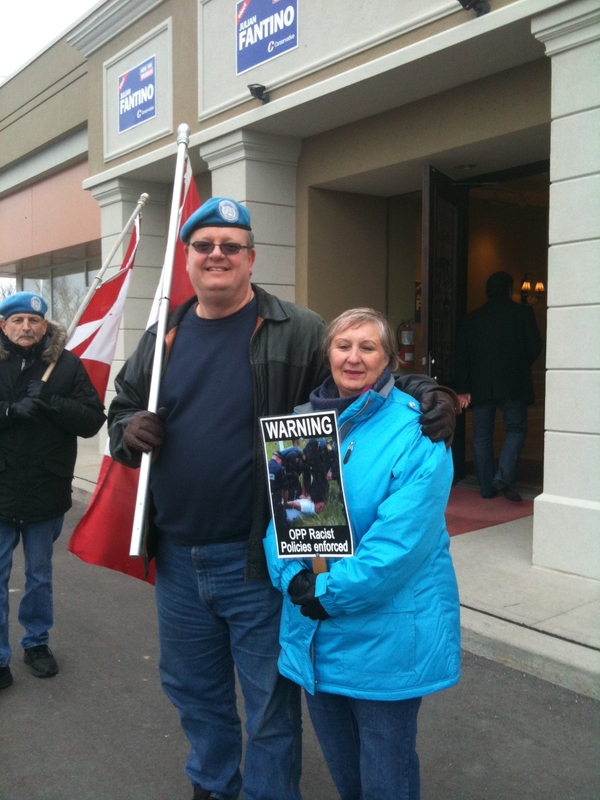 My friend, CANACE co-founder Merlyn Kinrade (who is also featured in Helpless) and I are both former peacekeepers and, since Fantino/McGuinty ‘justified’ suspending the rule of law in Caledonia by claiming it was a ‘peacekeeping’ operation we both wore our blue berets for some of our rallies in front of Fantino’s HQ in protest of this illegal peacekeeping mission on Canadian soil for the media. Rogers Cable did a stand up interview w/me on that topic, said the story would be aired in Richmond Hill area, so I didn’t catch it. 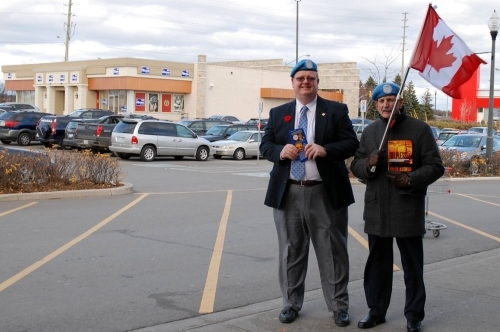 This picture is after the Rogers reporter left last week’s rally and was taken by CANACE co-founder Jeff Parkinson as we were handing out flyers at the Price Chopper grocery store which is 100 feet or so from Fantino’s HQ – in the background. Conservative blogger ‘Natasha’ who runs the very conservative and very well-written ‘Moose and Squirrel’ blog (www.mooseandsquirrel.ca) has become the first blogger to announce her withdrawal of support from the Conservative Party of Canada in a letter to the influential Blogging Tories website in which she terminates her relationship over the party’s decision to appoint former OPP Commissioner Julian Fantino as a candidate in the riding of Vaughan. As noted in her letter, however, her decision to disassociate herself from the site was premised on a belief that the CPC had failed her with its choice of Julian Fantino as a candidate, and not that the operators of the Blogging Tories had behaved inappropriately in any way (see also, Comment section below). Gary McHale in hospital after being repeatedly attacked by native smokeshack protesters, Dec 01/07. By the time this picture was taken Julian Fantino had already ordered his officers to target McHale for charges before the investigation had begun. He gave officers instructions not to “get bogged down with legal nuances” in order to get McHale, which resulted in charges of Obstructing Justice vs. Deputy Commissioner Chris Lewis and Supt. Ron Gentle who followed his orders. Click image for complete story & docs. A fan of Conservatives Against Fantino has produced what must be the finest video satire yet on Conservative Party assertions that Julian Fantino is a law and order friend of victims with a strong moral compass. 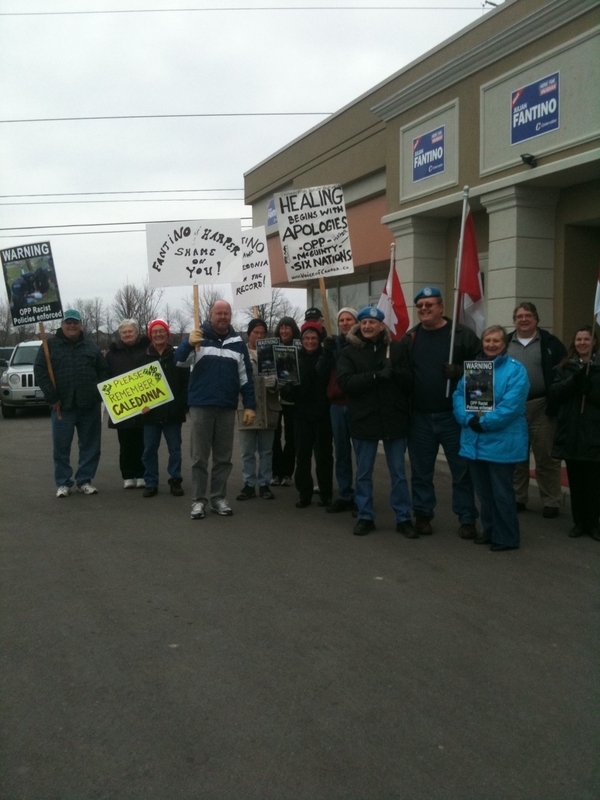 Readers might also enjoy this ‘Vaughtino’ video taken Nov 14/10 at a Conservatives Against Fantino protest at Fantino’s campaign HQ held before we split up to deliver some of our 60,000 anti-Fantino brochures in the riding. It’s funny, but over the course of my long newspaper career, I’d always previously defended Julian Fantino. His performance in Caledonia changed my mind, and I venture to say if more people knew just how he conducted business there, more minds might be changed. And that, methinks, is why he’s run the pop-up, peek-a-boo campaign he has, and enlisted, as Fantino-speak would have it, interlopers such as Don Cherry.